Any Bosch (or Bosch type) External Fan Alternator. It will fit many other Bosch Alternators. All parts are new. None are refurbished. These regulators are made for Bosch External Fan alternators. Here are some photos of typical Bosch external fan alternators. The one of the left of each photo is a 55 amp. The one on the right in each photo is a 100 amp type. 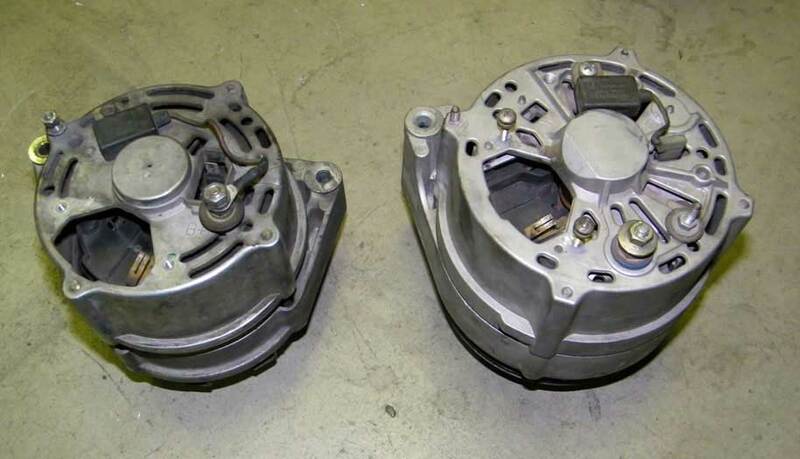 If you have a question about an alternator that DOES NOT look like these, please email! The ultimate voltage level seen by your cars components will have an exponential effect on power. So why suffer with low voltage, slower wipers, dimmer headlights and poor self esteem? "I finally have appropriate alternator output voltage. My car has never had enough voltage from its charging system. I installed your regulator, and was thrilled by the results. My Autronic SM2 engine management system is much happier. It idles noticeably better now, and I expect longer battery life as well. Thank you for an excellent product. Thank you for your fast service." "Installed both regulators. First thing I noticed was that both cockpit voltmeters were off by about a volt or more. Knowing the voltage at the battery terminals is a great relief. Both regulators tuned to 14.5 volts and seem to working GREAT. Thanks for making these fabulous products available." '79 BMW R100RS motorcycle and '84 BMW 663CSi, J.M., Jacksonville, FL. "I wish I would have found this adjustable voltage regulator when I first got my 142 three years ago...It is awsome!!! I guess I didn't know how bad I needed it until I fried another alternator!!! Your site is on my favorites now, thanks for the good communication and quick shipping!!! 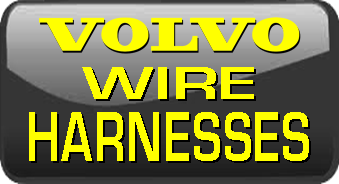 Volvo 142, C.B., Denver, CO.
"Just a quick note on how impressed I was with the external voltage regulator I installed on my 1987 Porsche 944 (non-turbo)..Super easy to install and the results are awesome..I was only getting about 13.4 volts out of the old BOSCH internal regulator and now am getting a constant 14.4 without any electric things running, and when I turned on the headlights, front euro fog lights and lower foglights and 800 watt amp for the subs I got an amazing 14.3 volts without any hesitation. I was looking for adjustable voltage regulators and found your website, I ordered 1 of each - external and internal.. noting that it would be difficult to adjust the voltage on the internal regulator I installed the external regulator set up. Before, with the old BOSCH regulator my car would run horribly with all the electric accessories running . . . . not anymore...WOW !!!! J.N., Phoenix, AZ. These are complete kits for any common Bosch 28mm slip ring Alternator (external fan type of course). 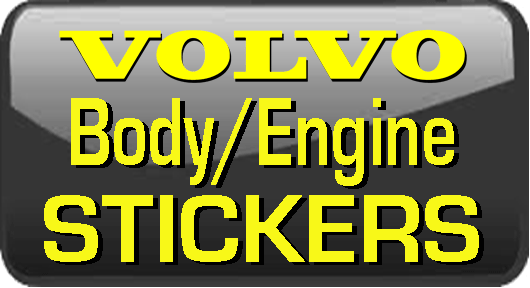 SCROLL DOWN FOR OTHER CAR FITMENT LISTINGS AND PART NUMBERS (or CLICK HERE). 3. A 34 INCH WIRE HARNESS. This regulator is adjustable to approximately 15 volts (some cars slightly more, some slightly less)... although I recommend a limit of about 14.4 to 14.5 volts. Typical adjustment range when a static bench test is performed is about 13.20 to 15.10 volts. 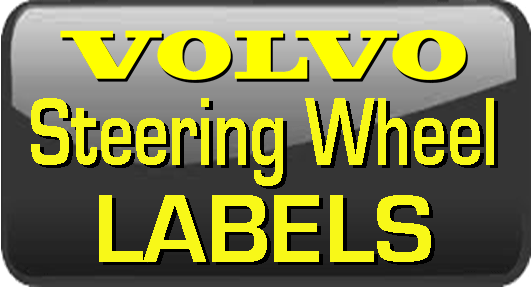 The harness I offer with this kit is covered with high quality black poly-vinyl (which matches the original black harness covering Volvo used). CUSTOM LENGTH HARNESS OPTION: If a standard 34 inch harness is not long enough for your installation, I can supply a custom harness of any length for a small additional fee. You may choose a harness with finished connector ends or with one or both ends unassembled. 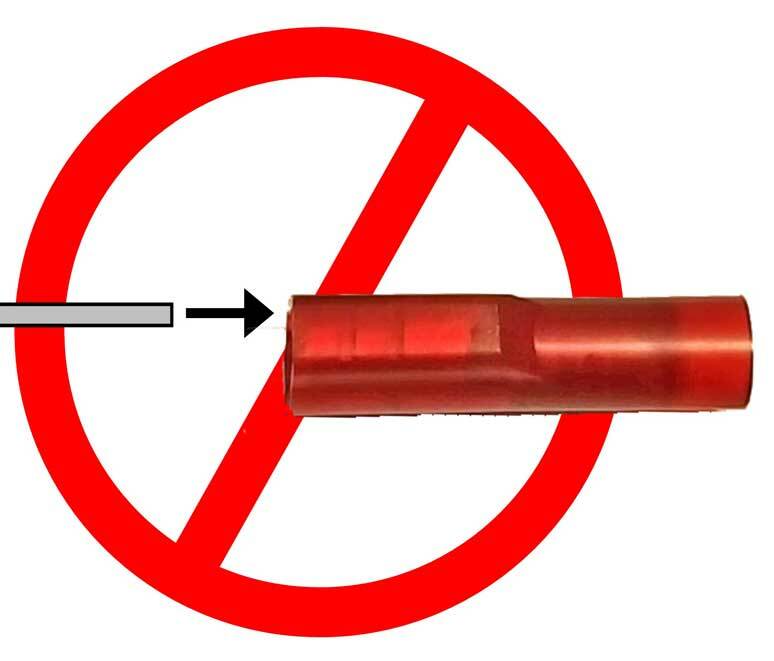 Unassembled ends would permit you to trim it to your preferred length if needed and then assemble the final connector end(s) yourself. This external style regulator works especially well with cars like the '81-'85 Volvo 240 Turbo, where the alternator is low in the engine bay and on the exhaust side of the engine. Access to the back of the alternator for adjustments can be difficult (pretty much impossible with a 240 Turbo). So getting a remote regulator makes good sense. Also, if there is a hot exhaust manifold or turbo close to the alternator in your car, mounting a remote regulator a further distance away from that heat will result in more consistent voltage readings. 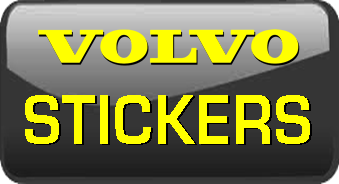 Scroll down to the installation tips to see a demonstration of how I installed this kit in one of my own Volvos. This item will fit all Volvo 240/260 '75-'93, 740/760 '84-'92 with a Bosch external fan alternator. These regulators will also fit MANY other Bosch external fan alternators, such as in a Porsche, BMW, VW, Audi and many others. This particular type fits those with 28mm slip rings ONLY. (A rare 32mm slip ring type is also available in an *Internal* Regulator below). Most external fan Bosch alternators have 28mm slip rings. 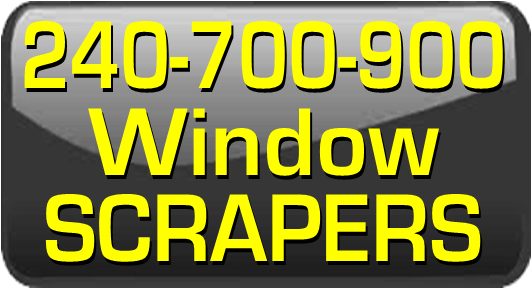 Scroll down for Part Number and Car Cross-References or email Dave. 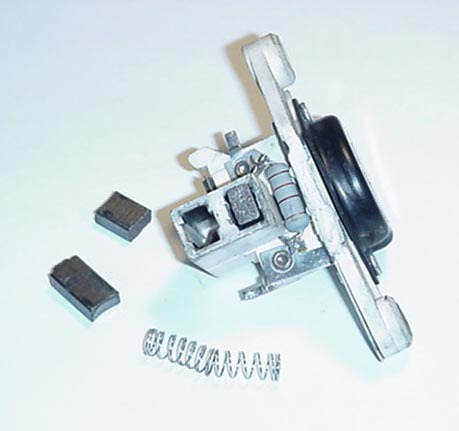 Available for 28 mm slip ring alternators. CUSTOM LENGTH HARNESS: If a standard 34 inch harness is not long enough for your installation, I can supply a custom harness of any length up to 6 feet for a small additional fee of $5.00. Harnesses normally come with FINISHED connector terminal ends, however you may choose one or both ends unassembled. Unassembled ends would permit you to trim a harness to your preferred length if needed and then you would crimp the final connector terminal ends yourself. Use the comment/special request box below to enter these details or requests. Shipping for Brush Assembly (not needed if you have already selected shipping for the above kit). Please Select Shipping for this Item and click "Add to Cart"
DISCOUNT: 2 or more for $40 each. RELATED ITEM: Do you need an extra or replacement Brush Assembly for the above External Regulator kit? Price: $20.00 plus shipping. Discount applies on orders of TWO or more for $18.00 each (automatically calculated in the cart). This adjustable external regulator is the same one included in the above full kit, but is available separately also. ORDER HERE: External Adjustable Regulator Only. Your discount will be computed in the cart upon check-out. After clicking "Add to Cart" above, please select your preferred Shipping below. Shipping for External Regulator. Please Select Shipping for this Item and click "Add to Cart"
This complete regulator/brush assembly can be installed in your alternator in place of your original Bosch or Bosch-type non-adjustable regulator. It's an all-in-one part and can be adjusted to an approximate maximum of 14.9 volts. I recommend setting a limit of about 14.4 to 14.5 volts measured at the battery at idle with no lights or accessories on. A typical adjustment range for this unit when a static bench test is performed is about 13.50 to 14.90 volts. 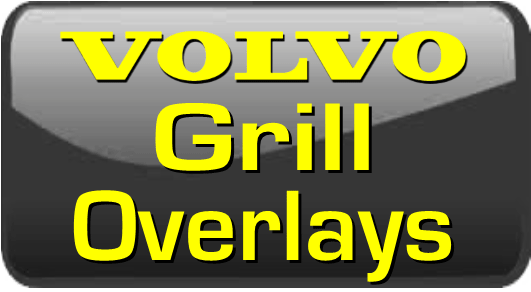 This style seems to be preferred for most owners of Volvo 740/760 or 940/960 series cars where the alternator is mounted high in the engine bay and the back of the alternator is easily accessible for adjustment. This regulator will work in a 240 also, but access to the adjustment screw might be difficult since the alternator is mounted low and forward of the exhaust manifold. This regulator is not recommended for a 240 Turbo, since it will be very difficult to make adjustments. Adjustment is done with a small flat screwdriver in the hole you see in the back of the regulator; CLOCKWISE to increase voltage, COUNTER-CLOCKWISE to decrease voltage. These regulators will also fit MANY other Bosch external fan alternators, such as in a Porsche, BMW, VW, Audi and many others. This particular type fits those with 28mm slip rings or 32mm slip rings. or 32 mm slip ring type (this type is very rare). A 20% discount applies on orders of TWO or more (i.e. : two for $25.60 each plus shipping). A 30% discount applies on orders of TEN or more (i.e. : ten for $22.40 each plus shipping). Shipping for Internal Regulator. Please Select Shipping for this Item and click "Add to Cart"
Internal Voltage Regulator, non-adjustable, 14.8 volt set point. This internal regulator can be installed in your alternator in place of your original Bosch or Bosch-type regulator. Factory set for 14.8 volts (standard non-adjustable regulators are usually set at 14.1 to 14.2 volts). These regulators will also fit MANY other Bosch external fan alternators, such as in a Porsche, BMW, VW, Audi and many others. This particular type fits those with 28mm slip rings ONLY. 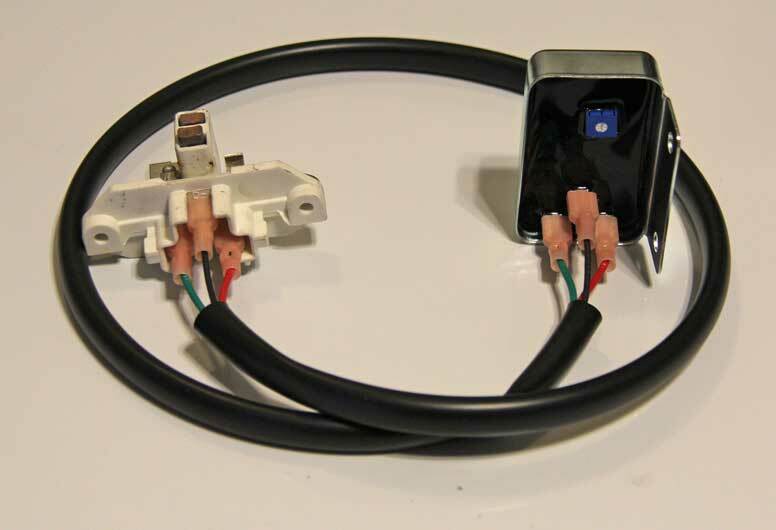 Most external fan Bosch alternators have 28mm slip rings. Fixed 14.8 volt set point. If you DON'T need an adjustable regulator, this will be the one you need. Fits 28 mm type slip ring only. 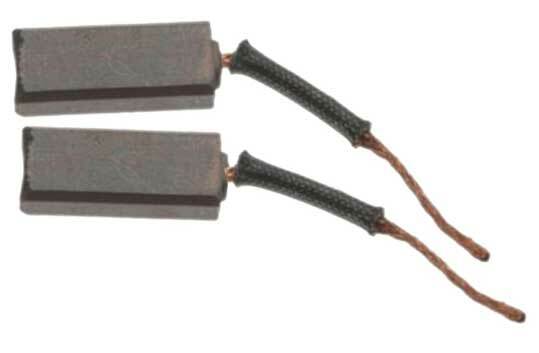 These are factory set for 14.8 volts (higher than the standard 14.1 to 14.2 volt type). NOTE: (READ THIS): Keep in mind that this DOES NOT MEAN you will get 14.8 volts from your alternator. It's for the same reason why you don't get 14.2 volts from your original 14.2 volt regulator. If you did, you would not be looking for a better regulator here. A 20% discount applies on orders of TWO or more (i.e. : two for $19.20 each plus shipping). A 30% discount applies on orders of TEN or more (i.e. : ten for $16.80 each plus shipping). ALL 28mm External or Internal Adjustable Regulators listed for sale above will exchange correctly with all the Bosch-type Voltage Regulator Part Numbers and Bosch Alternator Part Numbers listed here. Much of this information was compiled with the help of customers who have verified the correct fitment of these regulators over more than 10 years. If you have a regulator or alternator part number that you think should fit, but does not match these numbers, or one that fits and I need to add it to this list, please email me. 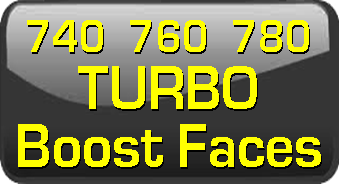 Audi 4000 84-87 1800cc, 4000 85-87 2200cc 5 Cyl, 5000 85-86 2000cc Diesel Turbo, 5000 84-86 2200cc 5 Cyl, 5000 Turbo 86-88 2226cc 5 Cyl, 5000 Turbo 86-88 2309cc 5 Cyl, 5000 Turbo Quattro 84-88 2226cc 5 Cyl, 5000 Turbo Quattro 86-88 2309cc 5 Cyl, 80/90 88-91 2000cc, Coupe 83-87 All 5 Cyl eng., Quattro 85-88 All 5 Cyl eng. : 025 903 023E, 026 903 015B, 034 903 015D, 034 903 803, 026 903 015F, 026 903 017, 026 903 017B, 026 903 017BX, 026 903 017X, 026 903 023, 034 903 015K, 034 903 015M, 034 903 016C, 035 903 017A, 035 903 017AU, 035 903 017AV, 035 903 017AX, 035 903 023B, 035 903 023D, 049 903 023P, 049 903 027, 049 903 027A, 049 903 027X, 068 903 017B, 068 903 017BX, 068 903 017P, 068 903 017PX, 068 903 018A, 068 903 018B, 068 903 029M, 068-903-803, 068 903 803D, 069 903 017A, 069 903 017AX, 069 903 023D, 069 903 023G, 069 903 023H, 176 903 027. BMW and Bosch PNs for BMW: 1711391, 1231-1271664, 1231-1279548, 1231-1711203, 1231-1713449, 1231-1713450, 1231-1714219, 1231-1714220, 1231-1722418, 1231-1722419, 1231-1726002, 1231-1726602, 1231-1726603, 1232-1271644, 1232-1711399. 320i '77-'83 with Bosch 0-120-489-039 and 0-120-489-040 alternator, 318i '84-'85 and '91-'92 with Bosch 0-120-469-617, 0-120-469-918 and 0-120-469-919 alternator, 325iX '88-'91 with Bosch 0-120-469-777, 0-120-469-778 and 0-120-469-779 alternator, 325e '84-'88 with Bosch 0-120-469-617 or 0-120-469-779 alternator, 325i E30 '87-'93 with Bosch 0-120-469-779, 0-120-469-985, or 0-120-468-105 alternator (NOT '92-'95 with Bosch 0-120-465-031 or 0-120-485-048 14mm alternator), 525i '89-'91 with Bosch 0-120-468-042, 0-120-468-043, 0-120-469-869, 0-120-469-912, 0-120-468-062 (opt 115A '91-'92), 0-120-468-064 (optional 140A '91-'92) alternator (NOT '92-'95 with Bosch 0-120-465-031 or 0-120-485-048 14mm alternator), 528e '82-'88 with Bosch 0-120-489-031, 0-120-469-617 and 0-120-469-778 alternator, 528i '79-'81 with Bosch 0-120-489-037 alternator, 530i '75 with Bosch 0-120-400-771 alternator, 535i '85-'93 with Bosch 0-120-468-007, 0-120-468-008, 0-120-469-775, 0-120-469-776, 0-120-468-096, 0-120-468-098 alternator, 633 CSi '78-'81 with Bosch 0-120-489-037 alternator, 635 CSi '79-'89, 733i '78-'81 with Bosch 0-120-489-037 alternator (lacking info on later 733 and early 735), 735i '87-'92 with Bosch 0-120-468-007, 0-120-468-008, 0-120-468-013, 0-120-469-775, 0-120-469-776, 0-120-468-096 and 0-120-468-098 alternator, 750i '88-'94 with Bosch 0-120-468-030, 0-120-468-033 and 0-120-339-547 alternator, 850 Ci/CSi '93-'95 with Bosch 0-120-468-033, 0-120-339-547 alternator, M3 E30 '87-'91 with Bosch 0-120-469-804, 0-120-469-805 alternator, M5 E28 '87-'88 (it will fit, but I'm lacking specific PNs), M5 E34 '91-'93 with Bosch 0-120-468-073, 0-120-468-074, 0-120-468-050, 0-120-468-051 and 0-120-468-067 alternator. Mercedes Benz 002-154-4106, 002-154-5106, 002-154-7206, 002-154-7906, 007-154-48-02, 007-154-51-02, 007-154-52-02, 007-154-53-02, 007-154-54-02, 007-154-55-02, 007-154-56-02, 007-154-57-02, 007-154-58-02, 007-154-60-02, 007-154-61-02, 008-154-20-02, 008-154-87-02, Mercedes 190D '84-'89, 240D 2.4L '75-'83, 280 and 280C and S 2.8L '73-'76, 280CE and E and SE 2.8L '77-'81, 300D and SD and TD 3.0L '78-'81, 450SE and SEL '73-'80. Porsche 0 190 601 006, 0 192 052 006, 1 197 311 090 (1976-77 930 with SEV alt - external reg fits), 944 603 14100, 944 603 14101 (1983-91 944), 928-603-142-00 (1992-95 968), 928-603-153-00, (there are lots of other Porsche applications that are not listed for Bosch internal regulator, external fan alternators). Some other Porsche fitments: 1989-98 911 with Bosch alt, 1976 912 with Bosch alt - external reg fits also, 1970-76 914 with Bosch alt - external reg fits also, 1977-79 924 with Bosch alt, 1986-88 924 with Bosch alt, 1983-91 944 with Bosch alt, 1978-82 928 with Bosch alt, 1985-95 928 with Bosch alt (NOT Paris Rhone or Valeo alt), 1992-95 968 with Bosch alt. Saab 8571846, 8590549, Saab 99 '73-'80 with Bosch 0-120-400-922 and 0-120-489-881 alternator (not models with SEV alternator), 900 Turbo and non-turbo '79-'94 with Bosch 0-120-468-067, 0-120-489-881, 0-120-469-683, 0-001-311-108, 0-120-489-253, 0-120-469-611, 0-120-469-682 alternator (not '94 and later with the newer internal fan alternator), 9000 '87-'94 with Bosch 0-120-468-035, 0-120-468-045, 0-120-469-682, 0-120-469-684, 0-120-469-881 alternator. Volkswagen I get a lot of questions about VW applications. Hopefully this will help, but feel free to ask if you don't see yours. Cabriolet 84-93 1800cc, Corrado 1800cc 89-92, Fox 87-93 1800cc, Golf 85-92 1800cc, Jetta 83-84 1715cc and 1780cc, Jetta 85-92 1800cc, Golf or Jetta 1600 diesel 85-86, Jetta 1600 diesel 89-92, Passat 1800cc 91-92, Quantum 85-85 1800cc, Scirocco 83-84 1780cc, Scirocco 85-88 1800cc, SEE NOTE BELOW REGARDING VANAGONS: **Vanagon 83-84 1913cc, Vanagon 1913cc 89, Vanagon 86-92 2100cc**, AL30X, AL32X, AL173X, 021 903 023E, 025 903 023D, 025 903 023DX, 026 903 015, 026 903 015A, 026 903 015AX, 026 903 015D, 034 903 803, 37 903 018A, 037 903 023A, 037 903 023P, 068 903 017L, 068 903 017LX, 068 903 017N, 068 903 017NX, 068 903 017Q, 068 903 018, 068 903 018X, 068 903 029C, 068 903 029E, 068 903 029Q, 068 903 029QX, 068 903 033E, 069 903 023F, 068-903-803, 068 903 803D, 176 903 029. Warning - VANAGONS: There has been something strange going on with some Vanagons. Just Vanagons. 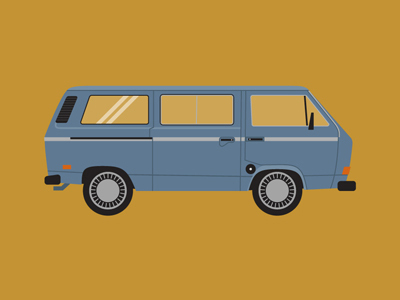 No other VWs. 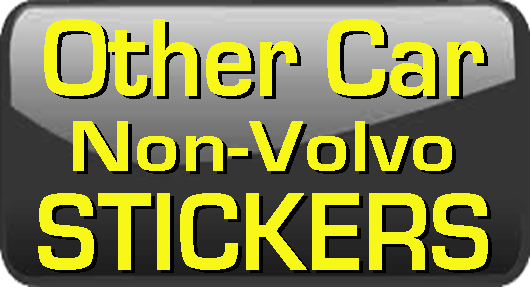 I'm not that familiar with these vehicles, but there have been issues reported with about 6 Vanagons over the past several years (up to about 2017) when using the adjustable regulators offered here. Specifically the symptom was the alternator was failing to charge above about 4000-4500 RPM (or sometimes the battery light would come on at high RPMs). When this has occured, re-installing the old regulator resulted in normal charging again. Some have suggested it may be a vibration issue with some engines. No definite source for this strange behavior was found. So I need to advise you to consider this if you intend to use any of these internal or external adjustable regulators in a Vanagon. Strange, huh? VANAGON SUCCESS REPORT #1: November 2017. Michael C. from Newington, NH. 1987 Vanagon with AL33X alternator replaced by previous owner in 2009 (48k miles ago). External adjustable regulator kit installed. Michael reported he needed to flash the field upon installation (details about that HERE). He has a volt gauge and has been monitoring for 1000 plus miles with no issues. VANAGON SUCCESS REPORT #2: February 2018. Richie reports: "Saw your Vanagon warning. I've been running one in my '84 Vanagon for about 6 years now. . . one of the first modifications I did. Never had a problem with it over thousands of miles and it charges my starting and house battery no problem at 14.5v in conjunction with my Blue Sea Systems ACR. I wonder what's going on with the others? Anyways, thanks for a great product." VANAGON SUCCESS REPORT #3: July 2018. 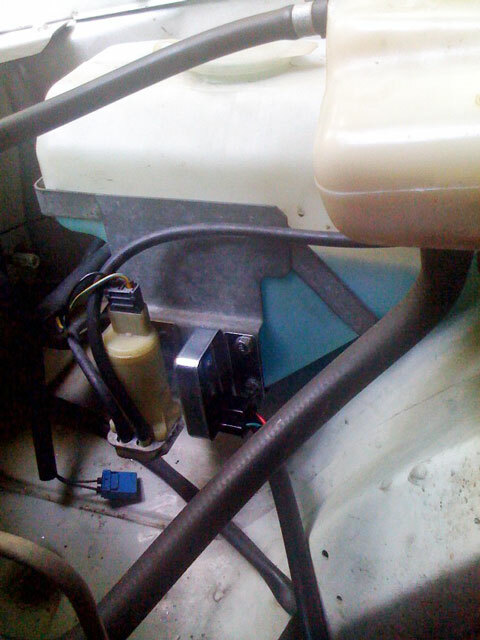 Danny S. reports: "Just a quick note that i've been using your internal adjustable voltage regulator in my 1988 vanagon with 2.1 litre for 1 year or so with no problems. Thanks for the great product." A 32mm Slip Ring Alternator is pretty uncommon. 32mm types will not interchange well with a 28mm type. 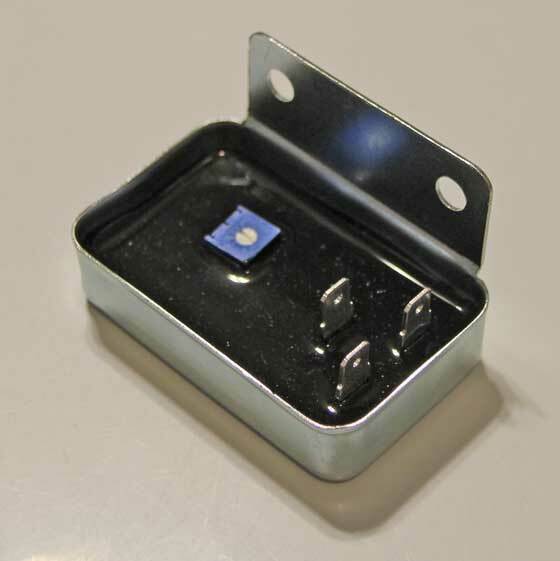 These Voltage Regulator Part Numbers are for 32mm applications. Volkswagen Scirocco 1981 with 65A alternator 32mm slipring, VW PN 049-903-015, AL116X. 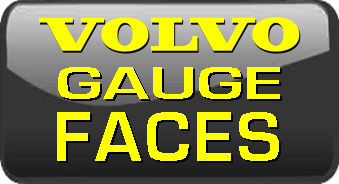 These adjustable regultators will do wonders for most Volvo 200, 700, or 900 series charging systems and those from many other cars with Bosch alternators. It permits you to set your voltage instead of relying on the preset voltage found (usually too low) in most older cars with Bosch alternators. I have been using these regulators in my Volvos for more than 20 years and I am very happy with them. Prior to installing one, I would typically find that my alternator would put out 12.5 to 13 volts with no load. At times, I have seen voltage at idle dip below 12 volts when under a moderate load, such as using headlights and the heater blower fan. I have seen voltage frequently dropped so low that my stereo amplifier would cut out. If you don't have a good voltage (minimum of 12.6 volts), engine control units can be negatively affected and your battery may not charge properly. On my '84 245 Turbo, I found an advantage when using a external mounted regulator. I was able to mount the regulator further away from my hot exhaust manifold and turbo. Bosch regulators have a negative temperature coefficient that causes the charge output voltage to drop as the device heats up. 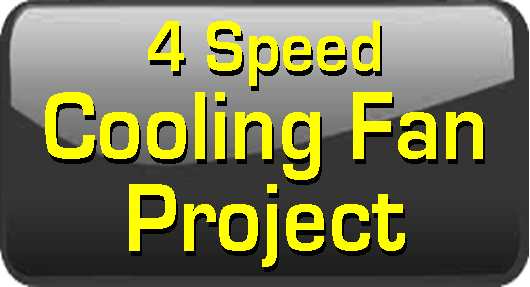 So a cooler running regulator can means much better efficiency. After first installing this kit in my 245 Turbo, I set the no-load voltage to 14.5 volts (if your voltage tends to dip at idle, setting the voltage at 1500 rpms mat be best). I was amazed at the difference. My headlights were brighter, my electric primary cooling fan was running faster, and my stereo amplifier worked perfectly for the very first time. Different cars can have different levels of improvement according to the state of your charging system and the amperage rating of your alternator. 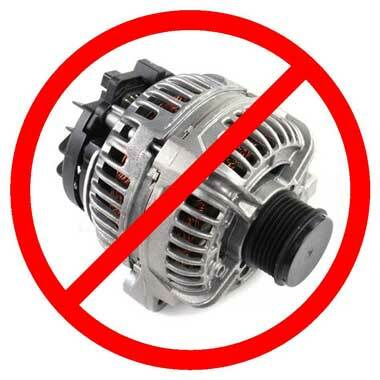 An 80 or 100 amp alternator will alway perform better under load than a smaller 55 amp type. My car was a good test for this regulator and the improvement was dramatic to say the least. Your own results may vary. "Just wanted to thank you for the regulator and let you know it's working very well. I'm quite impressed with how well made it is, and how easily the voltage is adjusted. The dashpot is very smooth and linear in how it varies the voltage." Will an adjustable regulator make my alternator always hold voltage at 14.2 volts like I want it to? My alternator output seems to drop at times, expecially with several things on at one time, like high-beams and air conditioning. Answer: An adjustable regulator will raise your voltage initial set-point. A stock Bosch regulator usually has a factory set-point of about 14.1 to 14.2v. Rarely will you actually see that much voltage with a stock regulator. And it will usually drop considerably under load and often more when hot. An alternator that has a smaller amp rating (such as 55 amps) will not hold a voltage set-point as well as one with 70, 80, 100 amps or higher when more load is added. So the answer is that it will likely still drop with load and heat. The benefit of setting your own higher initial set-point is that it will allow your charging system to handle loads better or even higher to some degree. For example, when my '84 242 Turbo had the original 55 amp alternator, the stock regulator usually had an output of about 13.8v with no accessories on. It would dip to below 12v with the A/C or other high-load things running. With the adjustable regulator, I was able to set it for 14.5v, but it still dropped some with my headlights on or when my A/C came on, but the drop became acceptable. A larger alternator from a later car with 80 or 100 amp capacity would improve the voltage drop under load. 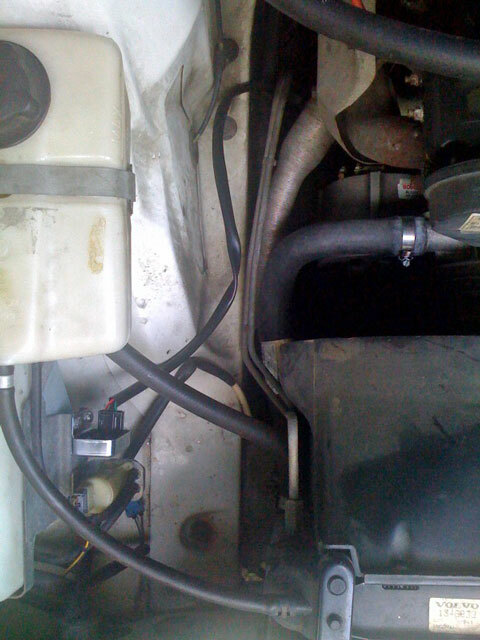 For instructional purposes, I installed an External Adjustable Kit in a Volvo 240 DL and wrote about it below. Before the installation, I checked the no-load voltage at the battery (engine running at idle) and found it to be 13.7 volts. This is pretty much average for a Bosch alternator in an old Volvo. Since most Bosch alternators typically produce less voltage at idle than with higher RPMs, and it might be hard to make your voltage outputs consistent depending on your idle speed. In these cases, you might try doing voltage output tests with the engine idle increased slightly to about 1200-1500 rpm, where voltage output may be more stable. The first order of business when installing this item: disconnect the negative side of your battery. You will be playing near the big red 12 volt positive cable on the rear of your alternator and you don't want any surprise ZAPS to occur. For BEST access to the rear of the alternator in a Volvo 240, you should remove it from the car. If you have a car with the alternator in a better position where you have lots of room to work behind it, such as a 740, then it will be easier to install while the alternator remains in the car. If you are not confident in your abilities with this type of installation, I recommend you have someone with experience help or have a professional install it for you. It is easy to permanently damage the regulator when installing if you don't know what you're doing (click here to see damage photo near bottom of page). The brushes are fragile and will BREAK if very much force is placed on them. 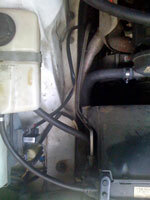 <<< In this photo, you can see the old internal voltage regulator attached to the back of the alternator. It's the black box thing (also below left photo). It's attached by two screws (sometimes slotted, sometimes Phillips)... a very simple removal... no wires to disconnect. If you are working on a 240 Turbo, you will definitely need to remove the alternator, since it will be impossible to get in behind it while still mounted in place. <<< Here's a photo of the old internal regulator I removed from the 240. It looks like an aftermarket type. <<< Here's the new brush assembly for the external regulator kit. Don't forget to remove the pin on this brush assembly before installation so the brushes will extend as needed. The pin is only there for shipping and storage to protect the brushes. NOTE: During these procedures it is best not to handle the brushes with your greasy hands as you can contaminate them and reduce their efficiency. <<< Here the new brush assembly is installed in the alternator. I have also securely mounted the external regulator (the silver metal box near the radiator fan). You can see the harness connecting the two components. It really couldn't be much simpler. The regulator can be mounted anywhere under your hood within the 30 inch reach of the harness (or elsewhere if you request a longer harness). Total installation time was about 45 minutes, but a first-timer might be longer. CAUTION: I do not recommend mounting this regulator along the FENDER EDGE. It turns out that rain or water when you wash will pour through the space between the hood and fender and the regulator wil be repeatedly doused with water. The regulator is fully potted and waterproof, however I have found that corrosion on the contacts can begin quickly when this occurs and that corrosion will interfere with the signals to and from the regulator. A typical symptom will be unwanted fluctuating voltage. After reconnecting the battery, I started the car and checked the voltage (measuring it at the battery with a volt meter). The factory preset voltage for this adjustable regulator seemed to be around 14 volts. I like it a little higher, so I used a small flat screwdriver to turn the voltage up to 14.5 volts, before turning on any lights or accessories. The little screw needs to be turned CLOCKWISE just a little bit to increase voltage, COUNTER-CLOCKWISE to decrease voltage. The screw is very sensitive, so move slowly. Also, do not force the screw past its limit as you will damage the regulator. IMPORTANT: I do not recommend adjusting this regulator without accurately knowing the voltage. You should use a real voltage meter hooked up at the battery to see what you are setting it at. Please don't rely on your in-dash volt gauge, unless you have verified its accuracy. They are not always accurate. 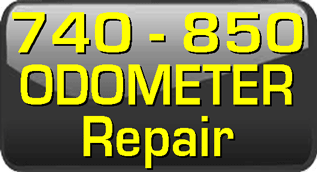 Do yourself a favor and buy an inexpensive digital meter to accurately measure your voltage at the battery. NOTE: When installing a new part like this, it's common to find it making lower voltage on the first start-up. The brushes are there to make electrical contact with the slip rings inside your alternator. Sometimes is takes running the car for a couple minutes before those contacts wear in and begin working perfectly. Scroll down for more info on this. "My recent (external) adjustable voltage regulator installation went really well. Thanks for making such a nice product. I thought you might be interested to see a clean and simple installation of the remote adjuster in my Volvo 240 (photos at right). It turns out that the 240 cage/bracket that secures the windshield washer fluid tank has a perfectly good spot for mounting the adjuster bracket; in fact, one of the necessary mounting holes was already there. I removed the washer tank to gain access and space so I could drill the other bolt hole, and then I used two flush/recessed blind nuts to secure the mounting bolts from the back-side and it worked out perfectly. It kind of even looks stock! Just thought I'd share, since it worked out so well... Thanks again." Here's a photo of the Internal Adjustable Voltage Regulator in a typical Bosch IR/EF (Internal Regulator/External Fan) alternator from a Volvo 740 GLE. Installation is easier in most cars if the alternator is removed. 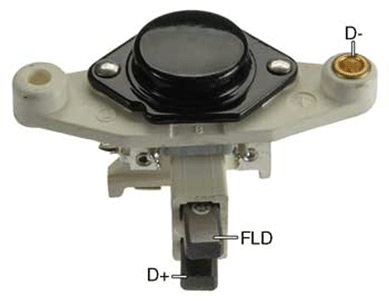 The voltage adjusting screw can be seen in the back of this adjustable regulator. The very first thing I can recommend if you are having charge issues or low voltage, check your ground cables at the alternator and battery. I have seen people forget to reconnect alternator grounds and I have experienced broken and loose ground cables before. They can drive you nuts. Often it's a simplest things when problems like this come up. After switching from an Internal Regulator to an External Regulator Kit, an initial FAILURE TO CHARGE can occur. 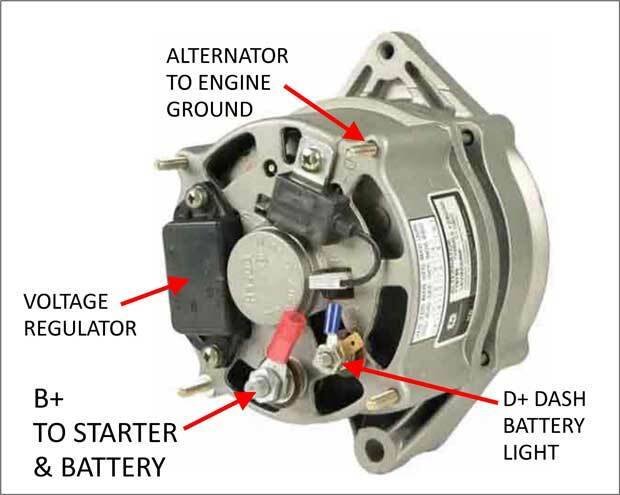 If you are converting from an INTERNAL regulator to an EXTERNAL regulator, in some cases the alternator will need to have the Field Flashed. The POLARITY of the brushes for an external regulator is REVERSED compared to an internal regulator. The direction of current through the alternator rotor is reversed. 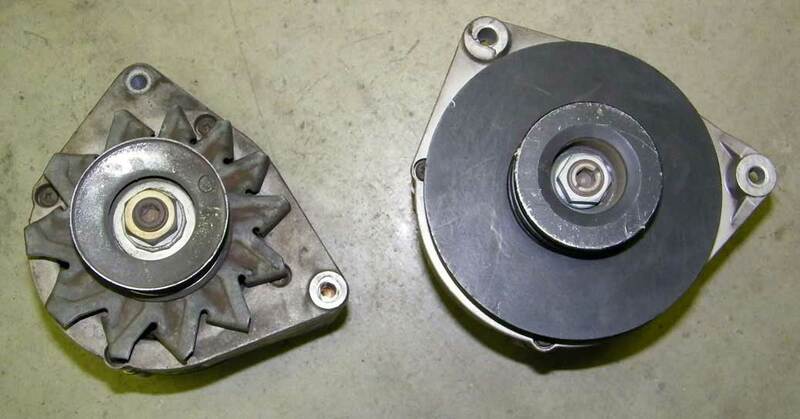 In any alternator, the rotor has a magnetic field, one pole being positive and the other negative. In most cases, when starting the engine after installing a regulator that reverses the current, the magnetic field will reverse on its own and your alternator will begin charging just fine. But once in a while, the current required to do this isn't strong enough to overcome the existing polarity that has been set in one direction for years. Flashing the Field isn't all that mysterious. Alternator rebuilding shops do this to fresh rebuilds all the time. Flashing the Field in your Bosch alternator with the below EXTERNAL brush holder can be done by disconnecting the 3 harness wires from the brush holder on the alternator and then momentarily touching the DF spade on the brush assembly to 12+ volts directly from your battery using any piece of wire. Please note the car should not be running when doing this, but the alternator does need to be fully installed and properly grounded! After this procedure, then reconnect the brush holder and start the car. 1. Turn the car off. 2. Disconnect the harness from the brush assembly. 3. Take a piece of wire and touch the DF spade to battery positive for just a moment. 4. Plug the harness back in. You have a high-mileage alternator (this usually means it's pretty well WORN). I have seen this occur several times on my own installations and several customers have experienced it. After installing a new brush assembly or regulator, it was found to not be charging during the first time starting the engine. It can be quite puzzling and you may begin thinking initially you have a faulty regulator. A classic symptom is having good battery voltage, maybe 12.3 to 12.6 volts with the engine OFF, and having LESS voltage at the battery with the engine running. In this situation, turning the adjusting screw on the regulator will have no effect. If you have a failure after replacing parts, the obvious things to check will be your connections at the rear of the alternator. 1. The BIG RED CABLE is the main power cable. It goes to the starter motor and then to the battery. 2. The SMALL RED WIRE completes the Battery Warning Light Circuit (light on your dash) and if it is not connected properly the alternator may not charge. You will know this circuit is complete if you see the Battery Light ON when the ignition key is turned to the 'ON' position with engine still OFF. 3. There is a GROUND cable that is attached to the alternator case (usually a small stud with an 8 mm head nut). The other end will be connected to the engine or alternator bracket. If this ground is not complete, the alternator will definitely not charge. Also, if you have an external regulator, check the 3-pole connections at the brush assembley and at the regulator. It is possible that one of the wire terminal inserts in the plug became dislodged when the plug was pushed on. It happens. 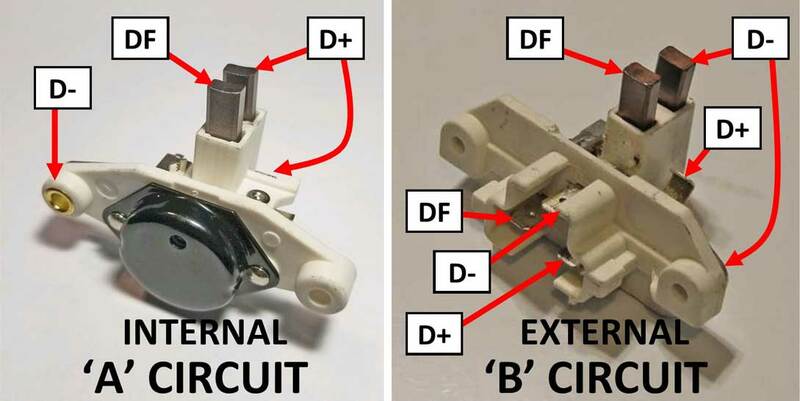 If the above connections are good, and still you aren't charging, it is possible there is a less than optimum contact between the NEW brushes and your OLD alternator slip rings. When I first discovered this I was quite puzzled, but as it turned out the friction end of the brushes just needed some time to wear in to establish good electrical connections with the slip rings. So it would seem one cure would be to continue running the engine until the voltage regulator starts working... the theory being that once a good electrical connnection is established the voltage should come up. This has worked for some customers. Once you remove the old regulator use some fairly fine sand paper to clean (or "de-glaze") the slip rings. You can do this by spinning the alternator pulley by hand while reaching in the back of the alternator with the sand paper. I have been told by experts that it's recommended to use GARNET paper only (the orange stuff). This is because crocus cloth, emery cloth and silicon carbide papers can eventually damage the slip rings. With crocus cloth and emery cloth, the abrasive material is metallic in origin. It can flake off the paper and get down inside the alternator and can cause internal shorts. With the silicon carbide paper you can develop a contamination problem; the silicon can bond with the carbon in the brushes and cause greatly increased brush wear. Once your slip rings are clean, you can then pre-seat your brushes if you like (not required, but a good thing to do if you can). Wrap some Garnet paper (200 grit or higher) around a small cylinder around or near 28 mm in diameter and use it as a tool to slowly wear the appropriate arc into the brushes. This will help them to seat faster, preventing sparking, poor wear and it will increase the life of the brushes. Lights Pulsing or "Flickering" or you have Fluctuating Voltage at Idle. 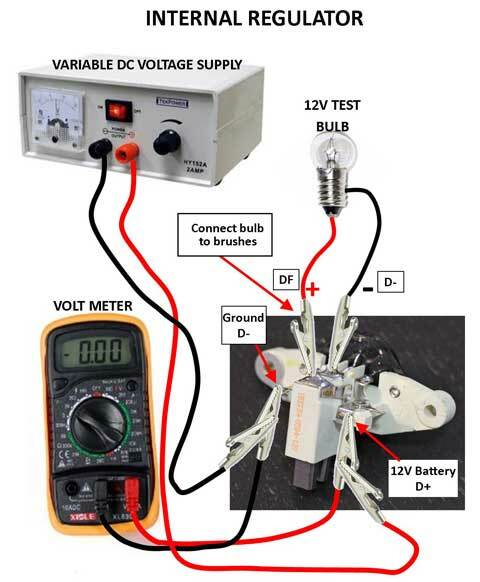 If you have installed an external voltage regulator kit and you are getting fluctuating voltage, the problem is often a bad connection. First check the contact points and terminals on the regulator and also the brush assembly for any signs of CORROSION. Then clean the contacts and re-plug and try again. If corrosion occurs on the external regulator spades, you might reconsider where you mounted it. I do not recommend mounting a regulator along the inner fender, since water freely runs between the hood and fender and will repeatedly douse your regulator. These regulators are fully potted and waterproof, however moisture is known for creating corrosion on electrical contacts and such corrosion will interfere with voltage levels. Also, it would probably be a good idea to put a little Anti-Corrosion Electrical Paste on these contacts if you live in a place where things get wet. Read more about that HERE. <<< This is not normally something I should have to explain, but caution must be taken when plugging a female terminal onto a male regulator or brush assembly contact spade. Some customers are allowing the male spade to slip OFF-CENTER between the insulator and metal terminal, creating a poor connection. Please make sure you get the spade CENTERED in the terminal. Check the alternator with a voltmeter. If this is an older car you should be checking the power and ground connections. Connections that are not solid or have a bit of corrosion can introduce resistance and a flicker can be a symptom. There is a YouTube video further down below for testing your Voltage Drop. OTHER CAUSES: A common reason for flickering lights is a worn out alternator. A bad diode inside it can cause this kind of trouble. A simple test can be done using a digital volt meter (DVM) to check the AC voltage feedback across the battery while the engine is running. Set your meter to ACV (or AC Volts) and connect to the battery positive and negative posts respectively. If the voltage reading is more than 0.5 volts (1/2 volt) there is a bad diode inside the alternator causing excessive ripple voltage. Most automotive parts shops have machines that will test an alternator for free, but keep in mind that these tests will often pass an alternator with a bad diode. Here is a YouTube video on testing for AC voltage feedback. You should not see more than 0.5 volts. 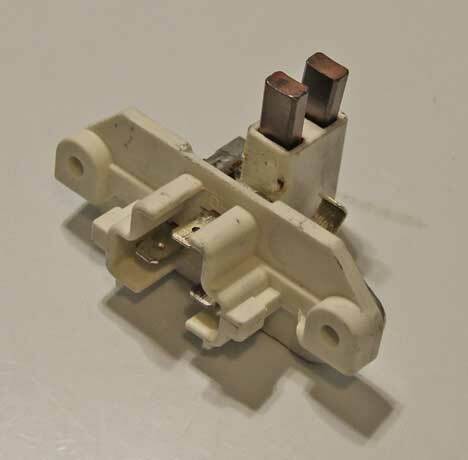 Electrical Parts such as these special regulators are delicate and do not hold up well to abuse. If you are not experienced with this sort of installation, then I STRONGLY recommend you have a professional or someone with experience install it for you. Otherwise, if you force the crud out of it and destroy it, please don't write me and tell me it simply "fell apart" on its own like this customer did. Please put your claw hammers away before installing one of these. 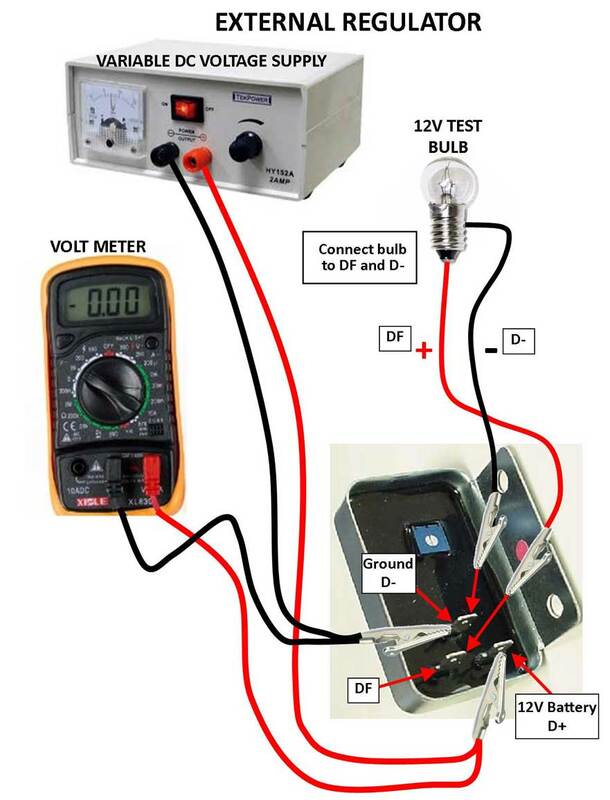 Voltage Drop Tests. The below video will help you determine the heath of your alternator power and ground connections. Is your dash warning light working correctly? Here's a quick and simple test. Take the D+ wire (small red wire) off of the alternator and connect it with a jumper to an engine ground (the braided ground at the back of your cam cover will work). Turn the key on. Does the battery lamp light up? Do the parking brake, brake failure and bulb failure lamps come on too? The battery lamp is good. Now you can concentrate on other areas. The below video is quite long, but excellent. At 10:20 it gets into explaining and testing a dash charge lamp circuit. It shows how you can attach a simple 12v test lamp (one end to battery+ and the other end to the D+ terminal on the alternator, not the brush holder). 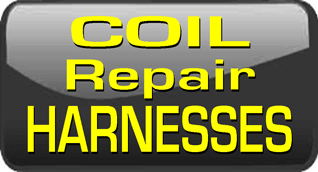 If the alternator then comes to life, you’ve discovered the problem is RELATED TO YOUR WARNING LAMP WIRE CIRCUIT. Another good explaination of how a Dash Warning Light works. A Bosch alternator only needs a short, initial shot of 12 volts (at the D+ terminal) to initialize or "boot" it into operation. 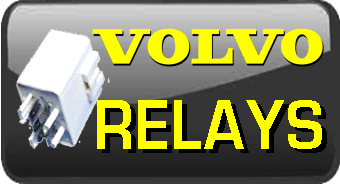 After the initial shot of voltage the alternator (generating electricity process) should be self sustaining from then until the car is shut off. Why is the dash charge lamp lit when you first turn the key to "ON"? The dash lamp is wired to the D+ terminal. It lights up when you turn key to "ON" because there is a GROUND potential coming through the D+ terminal (at the alternator) and it grounds the idiot lamp circuit. Turning the key to "ON" provides power to the other side of the bulb and the bulb then lights. As a Bosch alternator begins to spin up, it needs to have that initial excitation charge coming through the dash lamp, which "boots" the alternator into charging. Then as the alternator begins functioning, the ground output from the D+ terminal transitions from ground to +12 volts DC. This transition causes the dash lamp to stop functioning because you now have 12 volts DC standing on both sides of the lamp, thereby the lamp receives no current. We might think that most any 12 volt lamp hooked to 12 volts on one side and to the D+ on the other should be sufficient to initiate the alternator operation. It doesn't seem to work that way. The danger of too big a lamp (or resistor in line) is that you might cause a condition called "Run-On," where the output from the D+ terminal (through the lamp) can become strong enough to "backfeed" power to the ignition system. If this happens, when you turn off the key the engine continues to run and will only to stop after the wire to the D+ terminal is disconnected. Static Bench Testing: This YouTube video demonstrates a simple method for bench testing a Bosch style voltage regulator. 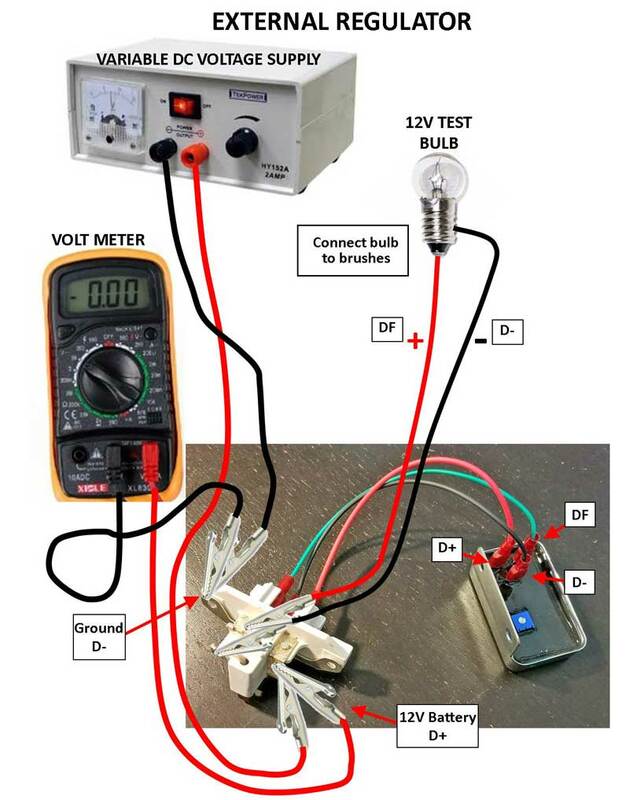 This test may be performed on any internal or external regulator (adjustable or non-adjustable) and it will tell you what the voltage the regulator is set to. Here are some simplified diagrams BELOW that will explain how a regulator may be hooked up for testing. You should follow the above video and these hook up examples if you want to test a regulator. This is how I test a regulator if a customer returns one for testing. They are almost never defective and this test will show it. If you are having trouble, I strongly urge you to look harder and do not be too quick to blame a regulator. If you are using an external regulator (this type has a separate brush assembly), the below Full Field Test method will be pretty easy to do. It will help you determine how well your alternator is charging. In case of a problem, this procedure can help you decide if the alternator is at fault or if the regulator is at fault. This test is standard procedure in older shop manuals. Basically, this test will be bypassing the regulator, so that a full 12V is applied to the alternator rotor winding. The voltage to your battery should rise to about 16V, so you should only run the engine just long enough to measure the voltage. On the wire harness I supply with the External Regulator Kit, the wire colors are: D- (BLACK), D+ (RED), DF (GREEN), which will be for D-: Ground, D+: Positive, and DF: Field. The bypass is applied by unplugging the regulator harness at the regulator end and jumpering the D+ (RED) to the DF (GREEN) socket pin. The remaining D- (BLACK) pin is already grounded to the alternator case as it should be. If you are unsure, you may ground this circuit. If you get around 16V or more when bridging the two circuits, the alternator is charging pretty darn well. The same test can be done with an internal type regulator setup by replacing the brush/regulator assembly with one that has been modified (regulator portion has been removed). An internal jumper needs to be placed between the D+ and DF pins. This could be made from an old bad internal regulator unit. Just make sure the brushes are still in good shape. 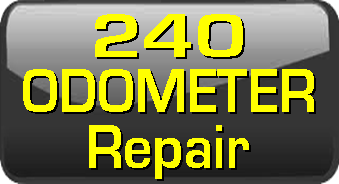 The most common symptom of worn brushes on any regulator will be drops in voltage while driving. It may be intermittent at first and you may notice the radio or other devices turning off or flickering. This condition will eventually drain your battery and your car will stop running. If you occasionally remove your voltage regulator to inspect the brushes, they will generally be considered worn out if one or both protrude less than 5 mm from the housing. Brushes on a new regulator will typically protrude 10 mm or more. New replacement brushes can be obtained from NAPA Auto Parts, PN ECH M407, typical price: $4.00 for a set of two. But what if I think my alternator is bad? Do you suspect you might need a new battery or have you been experiencing dead or weak battery problems? It walks you through testing a battery that has been suspected of weakness. You will be surprised to see the results and you'll find out why new battery conductance testers, that will test the battery Cranking Amps (CA) or Cold Cranking Amps (CCA) capability can really help. I bought one of these testers and now I even test a brand new battery to make sure it's putting out close to what it's supposed to. On occasion I get questions from customers who ask about using an adjustable regulator for a marine alternator. I don't know a lot about marine alternators, but I'm always happy to help if I can and I'm always willing to learn. So I will be adding relevant marine applications or topics here when I find them. I hope this helps. If you can help with this topic or have suggestions, please email. He had a sailing vessel with a Beta Marine diesel motor. He needed an alternator to produce a specific voltage range (13.6v) in order to optimally charge (not overcharge) his lithium iron phosphate LiFeP04 battery bank. While he could have searched for an expensive computer controlled regulator, he wanted something simple. He achieved it using one of the internal voltage regulators offered here. Here's an interesting article on the subject of automotive alternators and marine applications. Most people don't know that automotive alternators are designed to reduce output as ambient temperatures increase. 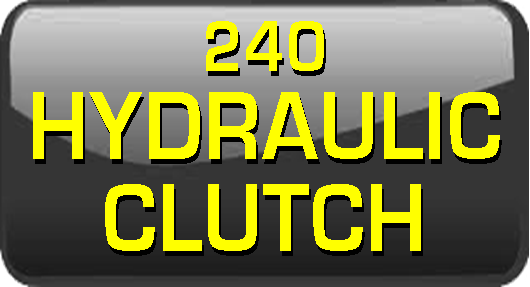 This is designed into car alternators so that they can better survive high under-hood temperatures long enough to live past the initial warranty period. 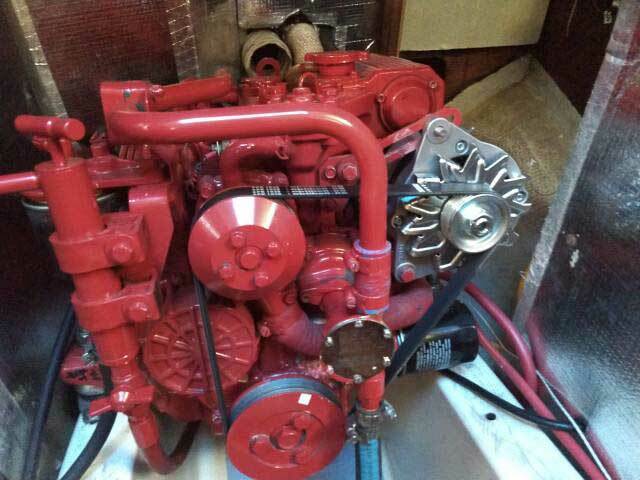 Typical marine alternators are NOT designed this way, since most marine engine rooms are not nearly as hot as a car.